I made a Pac-Man sprite in 2008, a year in which I was really trying to make the shift into scratch-made sprites. I really like the way the face turned out, but the arms and legs needed work. That sprite was meant as a set-up to recreate the 2012 thumbs-up pose sprite. I also made some changes to the palette now that I've gotten a bit better at making more efficient palettes. These newer sprites are closer to the official Namco artwork. 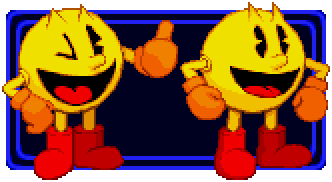 The Thumbs-Up pose is based on official art from Namco (the creators of Pac-Man). The "arms hanging down" sprite started as a recreation of the Arms Akimbo pose until I saw this pose in an NES/Famicom-looking screenshot while image searching for Pac-Man references.